Low. A band from Duluth, Minnesota, formed in 1993. 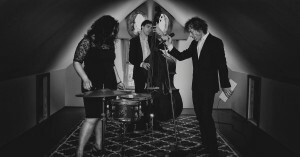 Featuring Alan Sparhawk on vocals and guitar and Mimi Parker on vocals and drums and Steve Garrington on bass. Sparhawk and Parker are married with two children; they first met in fourth grade in rural Minnesota. Garrington is the latest addition to the band.